Fall, or Autumn as the Brits refer to it, is just starting to set in. I’m getting excited as we approach October – my favorite month of the year. I’m looking forward to all of the leaves changing. Our new town has a lot more trees than the last place we lived, and there’s a huge park, so we’ll be able to see a lot more of the seasonal changes that really make fall the prettiest time of year. With the changing of the seasons comes a whole new flavour season – apples, pumpkin, and spices. Can’t beat it! This week’s bake has been staring at me from the cover of Southern Living once again. Since Ben and I were going to a dinner party, I of course couldn’t come empty-handed. For those who haven’t heard of a blondie before, it’s basically a brownie but without the chocolate. They have pretty much the same texture, but offers a wider flavour palette to play with since you don’t have to compete with chocolate. The recipe calls for using a cast-iron skillet (which I don’t have). 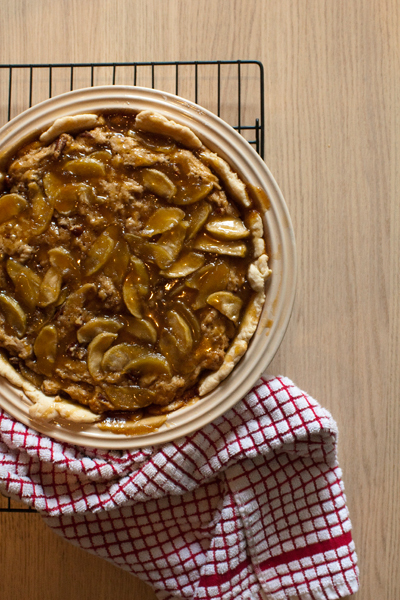 I used a Le Creuset ceramic pie dish and it seemed to work alright. (Although, now I have something new to add to my Amazon list for Christmas!) It also calls for using refrigerated pie crust, but I just made up a batch of shortcrust pastry. 1. First, peel the apples, and cut into 1/4-inch-thick wedges. You’ll want to work quickly so that they don’t start to brown. Toss the apple slices with 2 Tablespoons of the flour and 1/2 cup of the brown sugar in a large bowl. Melt 1/4 cup (57.5 grams) butter in a large skillet over medium-high heat; add apple mixture, and sauté 15 minutes or until apples are tender and liquid is thickened. Remove from heat; cool completely (about 30 minutes). 2. Preheat oven to 350°F (175°C). Melt the remaining 3/4 cup (172.5 grams) butter. In a large bowl, stir together 1 1/2 cups flour and next 2 ingredients in a large bowl. Add eggs, bourbon, the melted butter, and remaining 1 1/2 cups brown sugar, stirring until the batter is blended. Stir in your toasted pecans. 3. Fit your pastry into a 10-inch cast-iron skillet, gently pressing piecrust all the way up the sides of skillet. Spoon two-thirds of apple mixture over bottom of piecrust, spreading and gently pressing apple slices into an even layer using the back of a spoon. Spoon batter over apple mixture then top with remaining apple mixture. 4. Place pie on lower oven rack, and bake for 1 hour and 10 minutes to 1 hour and 20 minutes or until a wooden pick inserted in the center comes out with a few moist crumbs. Remove from the oven and allow the pie to cool completely. 5. To make the caramel sauce, cook the cider in a 3-qt. saucepan over medium heat, stirring often, 10 minutes or until reduced to 1/4 cup. Stir in remaining ingredients. Bring to a boil over medium-high heat, stirring constantly and allow to boil for 2 minutes. Remove from heat, and cool completely. 6. Once the sauce is cooled, it should be a lot thicker. Drizzle the top of the pie with about 1/3 of the sauce, then serve the pie with the rest so people can add as much as they’d like.